A unique hand-powered generator enables environmental quality measurements with or without batteries. 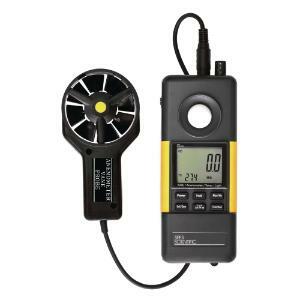 Combines an anemometer, hygrometer, thermometer, and light meter in a single rugged unit. Also reads any type-K thermocouple probe. The large dual LCD displays results and indicates low battery and out of range. Features touch-tone buttons, min/max, auto power off and hold functions. Ordering information: 5-year warranty. Comes ready to use in a foam-lined, hard-shell carrying case with instructions, 9V battery, easel back, and a tripod screw.